Is it spring yet? The copse of tiny crocuses next to my front steps seem willing to believe it. For me, the surest sign of spring is the blossoming of the April issue of InsideOCULA. 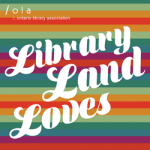 With their stories of ideas, passion, courage, empathy and initiative from the college and university libraries of Ontario, each article is as cheerful as a cherry tree against the brutalist facade of a campus library, a sakura of hope to brighten the profession! 🌸 In her inaugural OCULA President’s message, Melanie Parlette-Stewart reflects on the beginning of her career as a librarian and how she found support and encouragement in her professional community. Deciding to confront her doubts head-on by launching a series of workshops on imposter syndrome took courage and dedication, and motivated her to continue advocating for more inclusiveness in librarianship. Through her active participation in mentoring activities and volunteering for OLA and OCULA, Melanie is certainly practicing what she preaches and I look forward to the initiatives she will embrace during her tenure as the OCULA President! 🌸 Perhaps fittingly, the theme for this year’s OCULA Spring Conference is Building Better Libraries Through Diversity, Equity & Inclusion. Conference planners Monique Flaccavento, Catherine Fournier and Helen Tang have put together an inspiring program for the conference, which will be held on May 4 at OISE. Following a keynote address by Professor Nadia Caidi on “diversity by design” policies and lightning talks on current practices that support diversity, equity and inclusion in Ontario academic libraries, attendees will have an opportunity to explore these important and timely topics through a series of roundtable discussions. Don’t miss out. 🌸 Ensuring the library remains an inviting and inclusive space was a core motivation for Marnie Seal to transform a corner of Cambrian College’s library into a cosy “Zen Den”. Paying particular attention to students dealing with seasonal affective disorder and encouraging a positive dialogue around mental health, the Cambrian library team have created a small campus oasis and a welcome respite from the stress of student life. 🌸 Another college, another story of inclusion. At Niagara College, the development of the “Exploratorium” maker space provided an opportunity for the college library to offer a co-op position to a student with learning challenges through the college’s Community Integration program. Jaclyn Chambers-Page tells the story of this grassroots initiative that once again proved that “when libraries are fearless, the possibilities are endless”. 🌸 Fearlessness certainly played a role in the development of the colleges’ Learning Portal, as Jennifer Peters and Anabella Arcaya report in their latest update about this project. Among the materials all openly available through the portal, the modules on Indigenous inclusion and creating an accessible learning environment as mandated by the Accessibility for Ontarians with Disabilities Act (AODA) are proving especially popular. Look for even more quality content to be released this spring, including a faculty toolkit on using, developing and advocating for Open Educational Resources (OERs). No wonder that the Learning Portal was recognized with the 2018 OCULA Special Achievement Award! 🌸 We hear from another award winner in Jordan Pedersen’s account of the OCULA Lightning Strikes talks held at the OLA Super Conference this past February. Addressing topics as varied as social media preservation, artificial intelligence and Indigenous knowledge bases, this year’s talks were another sign that the drive to serve others with equity and respect is alive and well in the upcoming generation of library professionals. 🌸 Last but certainly not least, Lynne Bowker makes a compelling case for including librarians in regular quality assurance reviews for academic programs. Based on the disturbing finding that libraries are systematically left out of final assessment reports, Professor Bowker warns that this trend represents a missed opportunity for universities. Her recently published research concludes with a series of five constructive recommendations for closer collaboration between faculty and librarians. 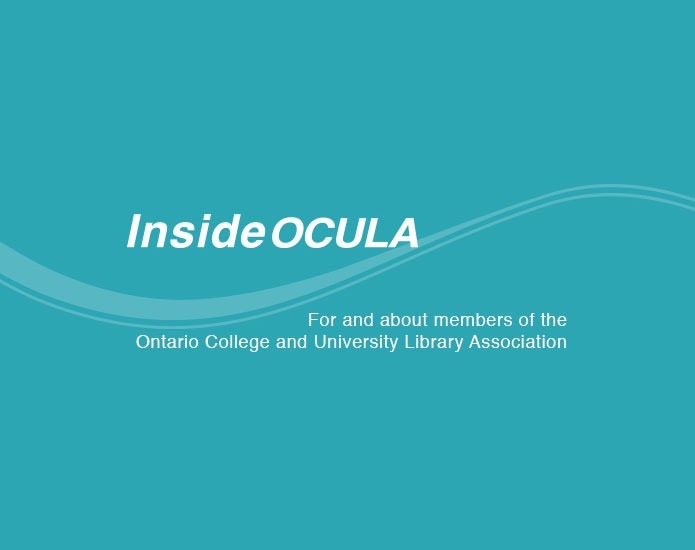 This issue of the InsideOCULA is another inspiring overview of what’s happening inside the always active community of academic libraries in Ontario! If you are interested in contributing to the conversation by highlighting a project you or someone you know are working on, we’d love to hear from you at insideocula@gmail.com. Clumsy floral metaphors optional. Thomas Guignard is Director of Services at the Ontario Colleges Library Service (OCLS) and an InsideOCULA editor. He can be reached at tguignard [at] ocls.ca. 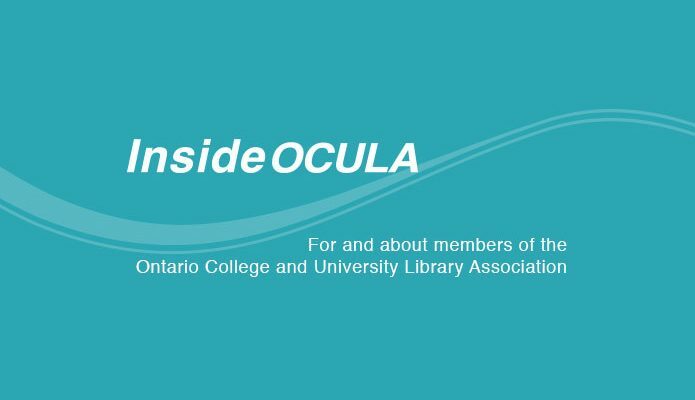 In this month’s issue of InsideOCULA, we begin by continuing our look at renewal initiatives, then explore special collections and events in two Ontario university libraries. Lastly, we have the final installment of the OCULA president’s column by Melanie Parlette-Stewart.